The masks for the names of objects that should be displayed in the panel. An object is displayed in the panel only if its name matches the include mask, unless it matches the exclude mask. Each mask may contain zero, one, or several name specifications, separated with a semicolon (;). Each name specification may contain the star character (*) to denote zero or more arbitrary characters a name may contain. For more information see Notes below. All objects of the appropriate type must be included in the listing. The Names specifications are not used for objects of this type. All objects of the appropriate type must be excluded from the listing. The Names specifications are not used for objects of this type. The files that are stored on the disks, as opposed to the virtual objects (such as the items in the Control Panel or Dial-Up Networking). The folders that actually exist on the disks, as opposed to the virtual folders (such as My Computer). The objects that point to other objects. The virtual folders that contain file system objects. Examples: My Computer, Network Neighborhood. The virtual folders that are not File System Ancestors. Examples: Recycle Bin. The virtual objects that are not folders. Examples: InBox. Press this button to reset all filtering criteria. This will make the panel to display all objects. Note: The system-wide filtering settings of Windows take precedence over the filters used by AB Commander. 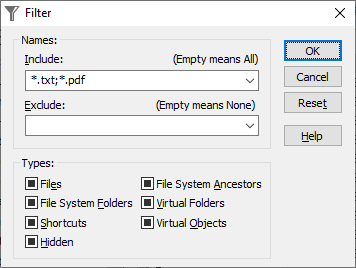 For example, if your system is set up so that no hidden files should be shown, they will not be shown by AB Commander even if the Hidden checkbox on the Filter window is checked. To change the system-wide settings, use the View - Options command of My Computer. First, the type of the object is determined (according to the classification given above) and the type is matched against the criteria set in the Types area. If the type of the object matches one of excluded types (represented by the cleared checkboxes), the object is excluded from the listing. If the type matches one of included types (represented by the checked checkboxes), the object is included in the listing. If the type does not match any of the types for which the appropriate checkboxes are not grayed, then the name of the object is matched against the masks set in the Names area. If the name matches the exclude mask, or does not match the include mask, the object is not included in the listing. The character comparison is NOT case sensitive. If an object matches both the include and exclude criteria, the exclude criterion takes precedence (that is, the object is excluded from the listing). The above filter makes the panel to display only objects which have the TXT and DOC name extensions, unless their names begin with A, B, or C.
The above filter makes the panel to display only the real folders. All other objects will be excluded from the listing. All real folders are included in the listing. All virtual folders (other than the file system ancestors) are excluded from the listing. All other objects are listed only if their names begin with A, or have the extension TXT.